Alison Lester never disappoints. She is a much-loved, award-winning author and illustrator with many successful books to her name. This delightful book is no exception. It has all the trademarks of a Lester success. 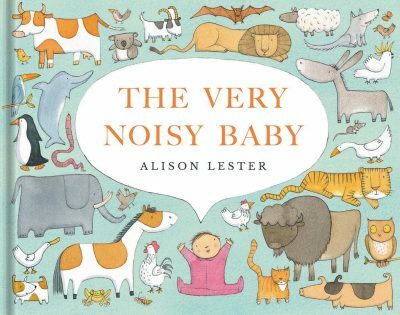 The noisy baby in the story can make many animal sounds, very loudly. One by one, the sounds are overheard by someone searching for their lost animal, and one by one the reader meets the baby’s family and the searchers who knock on their door. Each character is distinctive and recognisable when seen again later in the book. Finally, the family and all the people who have lost their animals come together for an entertaining solution to everyone’s problem—and a cup of tea. The format of this book is generously large, making it easy to share with a child on the lap. The illustrations are clear and simple, and the animals are recognisable and appealing. The rhyming text is very entertaining and will engage young listeners or beginner readers. There will also be lots of animal imitations after reading this book! This is highly recommended, especially for those with a baby in the family.